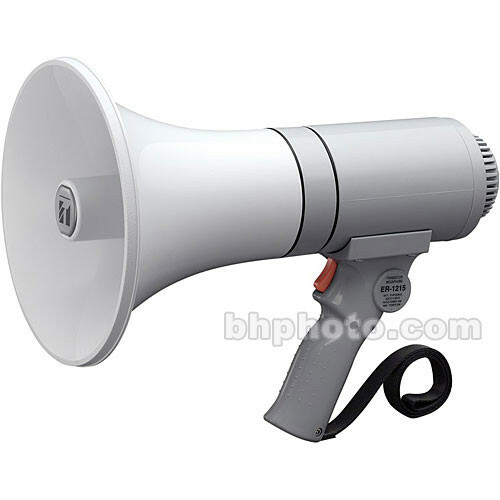 The gray Toa Electronics ER-1215 is a handheld megaphone designed to provide reliable voice amplification for indoor and outdoor public address scenarios. 15W of rated output power provide a maximum range of approximately 1033 feet. This megaphone incorporates an anti-bacterial treatment to ensure safe usage when passed from person to person. The ER-1215 features a durable ABS resin housing and a pistol-grip handle with a trigger-style talk switch and a convenient carrying strap. It can be powered by six C batteries (available separately) for up to 14 hours. Box Dimensions (LxWxH) 14.5 x 12.4 x 8.9"